SOMERVILLE, Mass. , Jan. 06, 2015 – Formlabs, makers of the Form 1+ 3D Printer, released new functionality that radically improves performance of their printers. 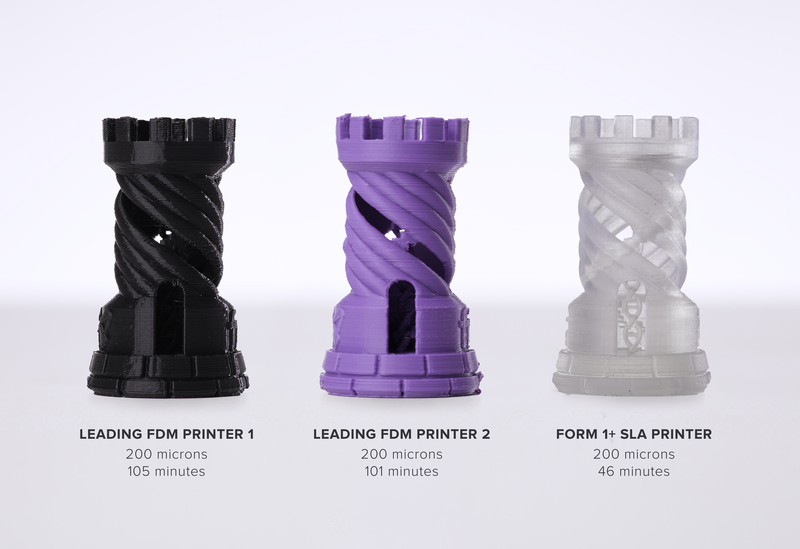 Draft Mode, a new print resolution, allows the Form 1+ to print up to twice as fast. While Smart Supports, a dynamic print-preparation algorithm, reduces print-time and overall material usage by up to 60%. For engineers and designers who need results fast, Draft Mode allows the Form 1+ to print thicker, 200-micron layers, without sacrificing surface quality. The precise, high-speed optical mechanics at the heart of the Form 1+ mean that head-to-head, it dramatically outperforms leading FDM machines at the same resolution. The feature is available in the latest version of PreForm and is available for all Form 1+ 3D Printers printing with Clear Resin. Smart Supports set a new standard in 3D printing software. They use a sophisticated algorithm to generate more robust and efficient print supports. “We looked a lot at trussed bridges and trees to understand more elegant and efficient ways to offer greater support with fewer contact points.” said Andrey Mishchenko, Formlabs Software Engineer. 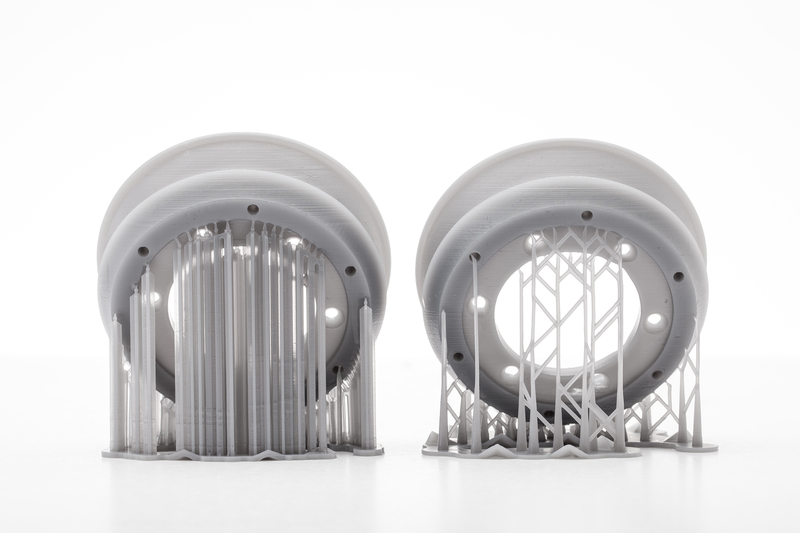 The new supports result in reduced print times and use up to 60% less material. These announcements come on the heels of Formlabs’ latest Functional Material release last month. Showcasing the company’s Flexible Resin, Formlabs’ engineer Adam Lebovitz made a 3D-printed speaker. Prototyped in Draft Mode and utilizing the new Smart Supports, the speaker, excepting the wires, magnets, and enclosure, is entirely 3D-printed. The software update with Draft Mode and Smart Supports, as well as a tutorial and models to create your very own 3D printed speaker are available now. 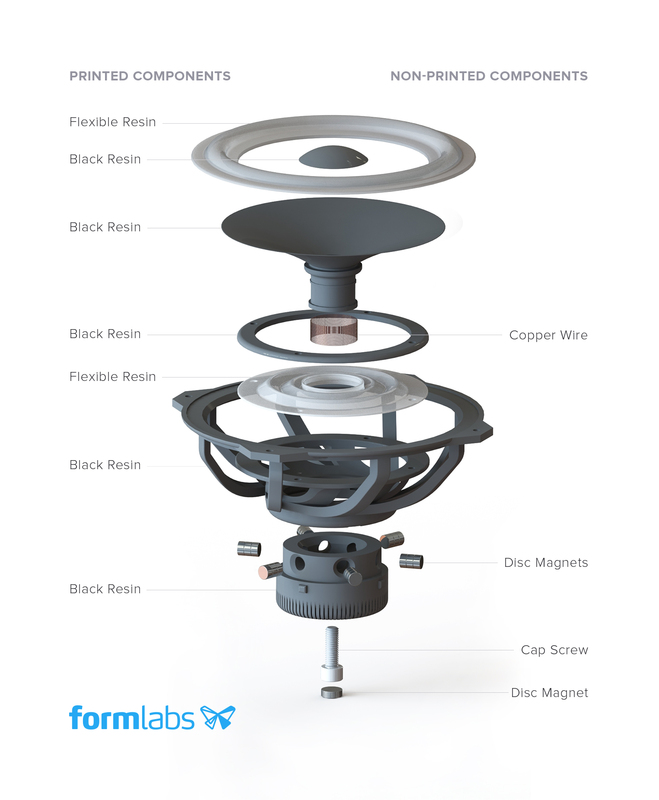 The 3D-printed speaker will be on display at Formlabs’ booth at CES 2015 Las Vegas.